We are excited to offer the following excerpt from Governance and Ministry, 2d edition, which will be published January 20, 2016. In too many congregations, leaders actually believe that partnership works best when boundaries of authority are fuzzy. Terms like shared leadership have become popular in recent decades, for reasons some of which are understandable and sound. Traditional modes of congregational life, where men dominated women, clergy dominated laity, and wealthy people dominated everybody, have fallen out of sync with the egalitarian principles, not only of congregations but also of society at large. Leaders can stay self-differentiated more easily when the boundaries of authority are firm—firm about which decisions the board makes and which it delegates; firm about who leads the staff and with what authority; and firm, for every category of decisions, about who leads the process, who must be consulted, who finally decides, and who takes charge of implementing the decision. When everybody knows which buck stops where, no one needs to hide information or defend turf. People actually can move closer to each other when they don’t have to worry about losing power if they enter into give and take. This principle applies to partnerships of all kinds, including partnerships of lay and clergy leaders. When it is clear where each buck stops and who will bear each cross, daily interactions can be more relaxed and flexible than when roles need to be negotiated every day. 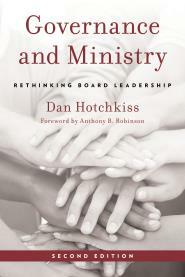 From Governance and Ministry: Rethinking Board Leadership, 2d edition, by Dan Hotchkiss. Copyright © 2016 Rowman & Littlefield. Used by arrangement with the publisher. All rights reserved. No part of this excerpt may be reproduced or printed without permission in writing from the publisher.